"The Total Economic Impact Study of Saama Fluid Analytics"
This Total Economic Impact (TEI) study was conducted to examine the potential return on investment (ROI) enterprises may realize by deploying Fluid Analytics which is commissioned by Saama technologies and delivered by Forrester Consulting. Fluid Analytics enables organizations to inherently accelerate their time-to-value on analytics and BI initiatives by building out their very particular modern analytics platform or system of insight as well as unlocking valuable customer data. 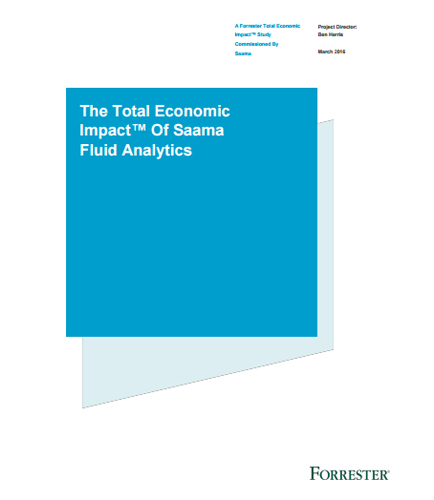 Download this whitepaper that represents multistep approach taken by Forrester for the ''Total Economic Impact analysis'' which examines the potential return on investment (ROI) that enterprises can achieve by deploying Saama Fluid Analytics Engine.